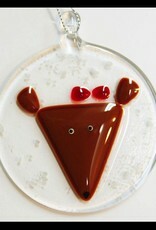 Beautiful and cute fused-glass girl reindeer with a red bow! Light sprinkling of snow falling all around! Comes with string for hanging. Approximately 3”D.